In case you haven’t figured it out, I was a longtime Libertarian activist. Most of the ideas on this site result in smaller government. However, they are much different from the current Libertarian Party platform. These days I often get more flack from Libertarians than from Democrats. Most of the ideas on this site are steps toward more liberty, so in theory the Libertarian Party should be a good fit. The Libertarian Party is easier to take over, because it is so small. It is easy to get on the ballot as a Libertarian if you are inclined to run for office. Given sufficient funds, a moderate Libertarian has a better chance in a very liberal district than a Republican. Given sufficient funds, a moderate Libertarian has a better chance in a very conservative district than a Democrat. I joined way back when I was a one-dimensional libertarian. My ideology has changed significantly since I had joined a quarter century ago. The LP has many extreme ideas in its platforms and its overall message, ideas that can destroy a good campaign in the final weeks. A moderate running on the ideas on this site can get tainted by the Platform. In the minds of many, the word "libertarian" means someone for whom freedom trumps all other political values. The LP has many extremist activists, some of whom are wont to sabotage the campaign of an LP candidate who is not “pure.” Interestingly, many of them will support a more moderate freedom-lover as long as he isn't running under the Libertarian banner. Much of the current Libertarian rhetoric is rightwing on economic issues. This puts the party too close to the Republicans, and leads to the lesser of two evils dilemma. I had hope for fixing these problems. For this reason I spent over two years expending my political energies supporting the Libertarian Reform Caucus (www.ReformTheLP.org). I was the webmaster of the site. If freedom is you primary value, but you also recognize that other values are also important, you might consider joining the Libertarian Reform Caucus and help finish the job of reforming the party. That is, if you believe the LP is worth reforming. Personally, I have come to the conclusion that it easier to start from scratch. 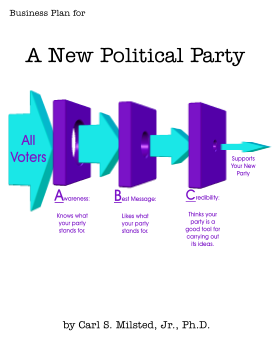 You have time to prove me wrong, as I don't plan on starting said new party until after taking a break from electoral politics.